On this truly auspicious day (10/10/10), news of the mysterious nature was revealed by atmospheric physicist Kent Moore, a professor at the University of Toronto’s Mississauga campus. 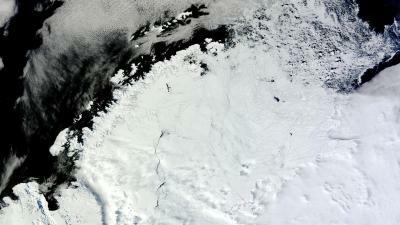 Reportedly, a hole as large as Lake Superior — or the entire state of Maine — has opened up in Antarctica, and scientists are stumped as to why it is there. Moore told Vice that the hole “is quite remarkable,” and that “it looks like you punched a hole in the ice.” According to the atmospheric physicist, areas of open water surrounded by sea ice are known as polynias. Though they are common in coastal regions of Antarctica, this one is confusing to scientists because the polynia is “deep in the ice pack.” As a result, it has been formed by processes that aren’t understood. “This is hundreds of kilometres from the ice edge. If we didn’t have a satellite, we wouldn’t know it was there,” said Moore. At its peak, the phenomena measures 80,000 k㎡. Intriguingly, another polynia was observed in the same location in the 1970’s. During that time, scientists’ instruments weren’t nearly as advanced as they are today, so the hole remained largely unstudied. It went away for four weeks; then last year, it reopened on September 9th for a few weeks. Now, it’s back again. Moore and his colleagues are using satellite images and deep sea robots to research the gargantuan hole. In the future, their findings will likely be published. “Compared to 40 years ago, the amount of data we have is amazing,” he said.